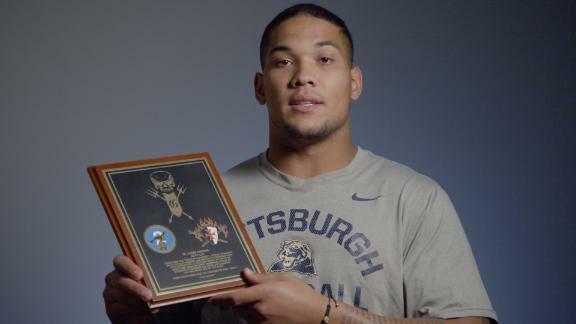 Pittsburgh RB James Conner expresses his gratitude for receiving the Disney Spirit Award. He also dedicates the award to all those who are battling cancer and talks about his relationship with Shelley Smith and Holly Rowe. 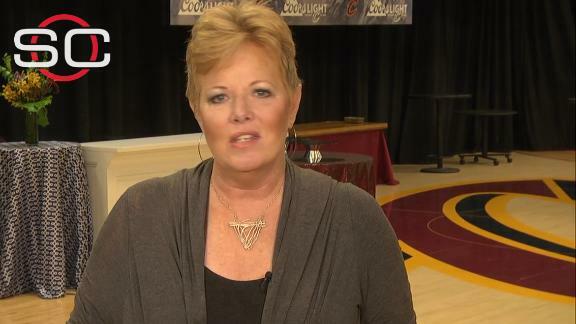 Holly Rowe explains how the Jimmy V foundation helped her while she was battling cancer. 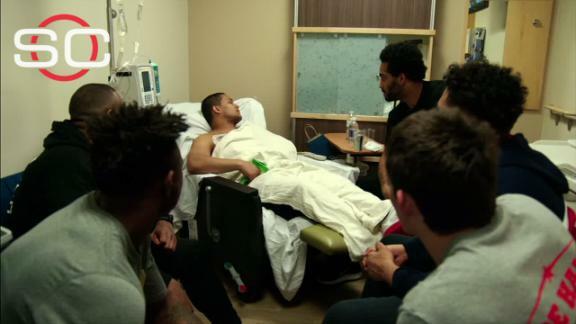 Pittsburgh RB James Conner was diagnosed with Hodgkin lymphoma in November of last year. During his recovery, he found comfort and support in the letters and items others sent him to help get him back onto the field for the start of this season. 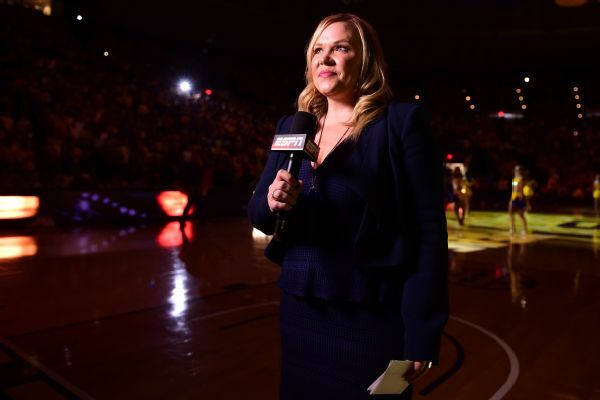 ESPN's Holly Rowe thanks the Mercury for "picking me up in a difficult time," as they honor her positivity and inspiration while she undergoes chemotherapy and radiation for melanoma. 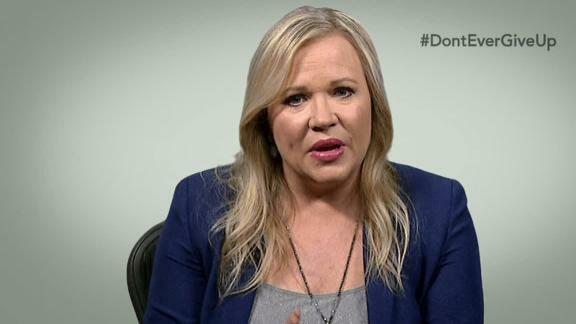 ESPN reporter Holly Rowe was just out of surgery one day in February to remove a malignant tumor from her chest. She would tweet that surgery "went well," but in reality, it was "one of the lowest points of my life." She lay on the ground, unsure how she could get past the pain and the nausea. "I felt mutilated," Rowe said. "I felt broken." Then she saw a tweet from Pittsburgh football coach Pat Narduzzi. It was a short, 10-second video of running back James Conner, who had been diagnosed with Hodgkin's lymphoma last December, running drills with a mask on after one of his chemotherapy treatments. "I was shocked," Rowe said. "I watched it over and over again. How is this kid doing this?" That day, Rowe got up from the floor and walked three miles on the treadmill. "Because of James Conner," Rowe said. "Because he showed me what strength looks like." Rowe was brought to tears standing alongside fellow cancer survivor Shelley Smith when they introduced Conner, winner of the 2016 Disney Sports Spirit Award on Thursday at The Home Depot College Football Awards. 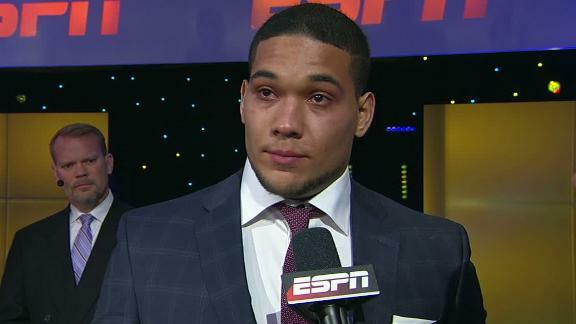 The award, which recognizes college football's most inspirational figure, and the moment -- from the 680-person standing ovation to the chants of his name -- brought Conner himself to tears when talking to ESPN's Tom Rinaldi. Conner dedicated his entire season -- the 1,060 rushing yards and 20 total touchdowns -- to everyone else who was fighting their own battle. "With that cancer, it don't care if you're black or white," Conner said. "It comes, and it comes hard. ... There's people fighting and they don't get this, they don't receive any awards if they win and when they win, and so this is for all of us." Conner, the 2014 ACC Player of the Year, revealed his diagnosis last December. He promised to not fear cancer, not even through the 12 chemotherapy sessions. During his speech, he talked about the other people who impacted him. Like 5-year-old Andrew O'Neill, whose wish was to meet him. And Smith, who beat breast cancer last year to return to broadcasting for ESPN. And Rowe. "We have a bond that can't be broken," Conner said about Smith and Rowe. "Them, we best friends now. To everybody going through this, they got a friend in me."